Duplicate Media Finder (DMF) locates and deletes identical files and similar media (PHOTOS, MUSIC or MOVIES, ...). By deleting redundant files, you will free up space on your hard drives, network/NAS, smartphones (Android, iPhone, ...) or cloud (OneDrive, DropBox, Google Drive, iCloud, ...). DMF displays the file contents directly as THUMBNAILS! DMF is a high-performance application that takes full advantage of new multicore processors. 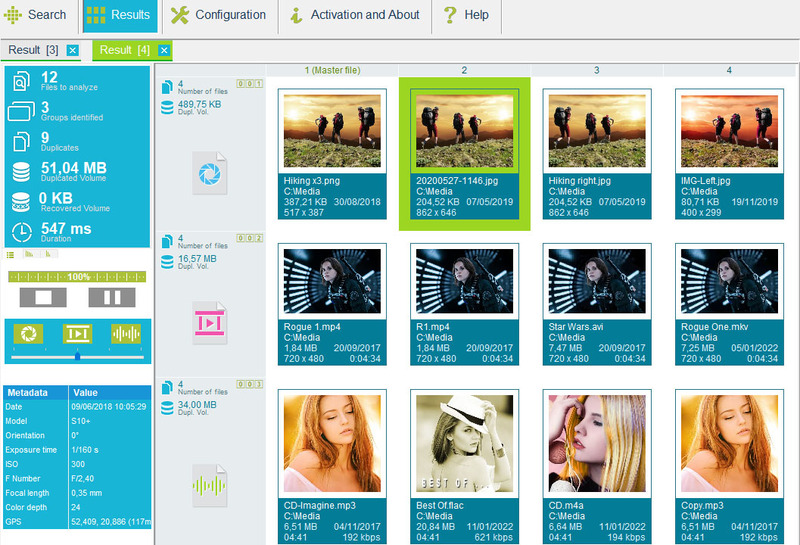 DMF can also find your similar photos, music or movies in different formats, resolutions, etc. It is packed with advanced functions (Automatic/manual selection, Symbolic or hard links management, Renaming/moving, Search criteria, Exporting, Sort, ...).